If a company is buying and/or selling internationally, by definition it is managing global transportation in some way. But that doesn't mean the company is truly thinking globally in terms of strategy, processes, division of responsibility and more. What progress are companies making in that regard? That was among a number of key issues SCDigest wanted to explore in research earlier this year on Benchmarking Global Transportation Management Strategies and Practices 2013. Our "fresh off the press" report, based on a survey of more than 300 global transportation professionals, features a new, very easy to read graphic style, and benchmarks a wide range of strategy, practice and technology issues. 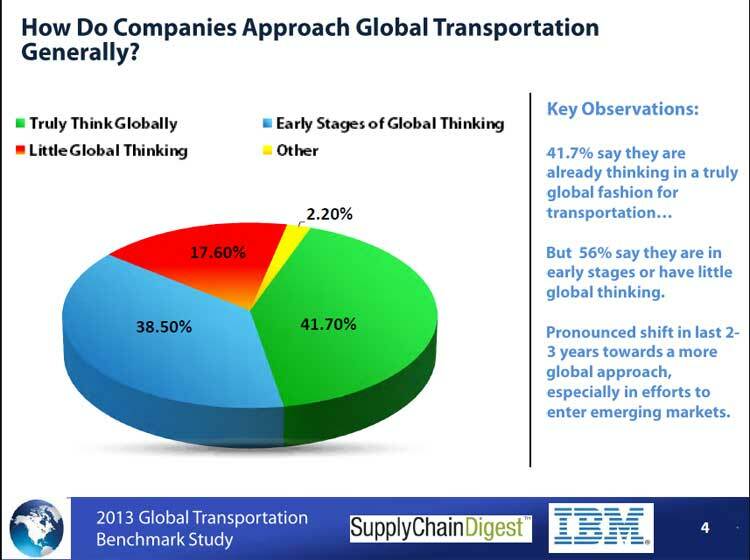 As can be seen, almost 42% now say they are truly global in their transportation management thinking - a figure we are confident is up substantially from say five years ago and maybe even from the past two to three years. But that still leaves the majority very early in their global thinking or having hardly begun at all. The report notes that while there has been a strong body of knowledge developed over the years relative to domestic transportation practices, there are comparatively few such guidelines and best practices relative to global transportation management. Probably about time that changed. We are confident you will enjoy the full report.